When we released MidBoss we wanted to run periodic events with unlocks for players. Today, on the anniversary of the Stonewall riots, we kick things off with our first event celebrating LGBT pride. A majority of the people we work with at Kitsune Games are part of the LGBT community in some way. 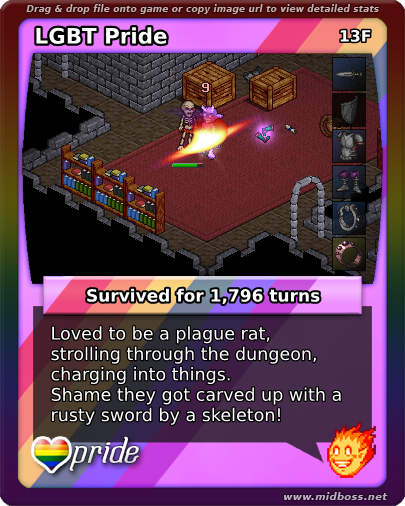 To celebrate them, diversity, and the queer community in general we've created a pride death card theme which you can use until July 30th. 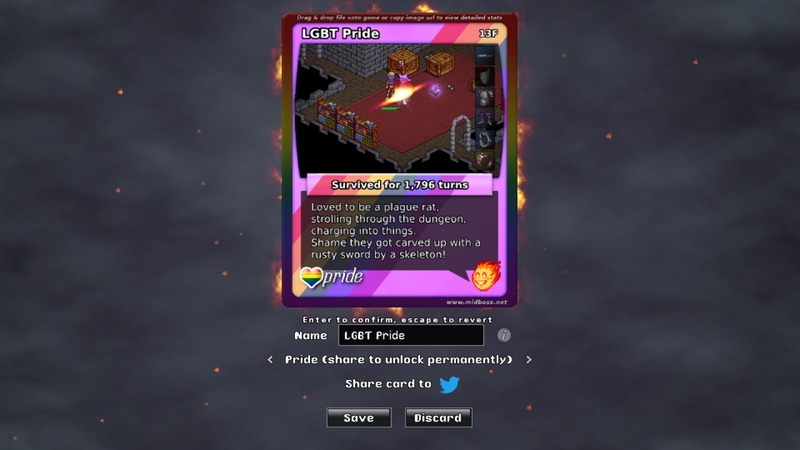 Additionally, you can unlock the theme permanently by showing your support for the LGBT community and sharing a death (or victory) card using the pride theme on Twitter. Itch users should be careful to back up their 'stats_totals.dat' file if they wish to keep the unlock across installs. Steam users get an inventory item which will unlock the theme regardless of install status. We're planning to make more events going forward so keep an eye out for future announcements!